The Awards for Excellence are annual awards that recognize excellence in the design and execution of a building that incorporates the use of architectural glass and metal. One award will be presented in each category (DESIGN and EXECUTION). The awards competition opens in January of each year. Any member of the OGMA in good standing may submit as many nominations as they wish. Projects nominated will be reviewed by a panel of judges consisting of one OGMA Director and two practicing architects. Submissions for nominations must include a minimum of 10 photographs of the nominated project and a comprehensive description of between 200 and 500 words. Submissions should be sent in digital format, accompanied by high resolution, print-quality photos. Nominations must be made on the official nomination form, which must be completely filled out. The project must be located within the Province of Ontario. The project architect must be registered with the OAA. The glazing contractor must be a member in good standing of OGMA. The project must have been completed within the last five years. Nominations must be made by a member in good standing of the Ontario Glass & Metal Association; however, the architectural/design firm need not be members. Members are not restricted in the number of nominations submitted. 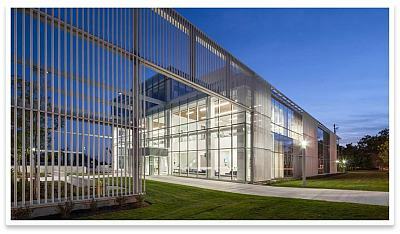 The project must incorporate glazing systems from North American manufacturers. Projects nominated need not be large; nominations can be made for portions of a project. Unique, pleasing or complex design or features. Level of difficulty in design. Level of difficulty in execution and the quality of fabrication and installation, as indicated in the photos provided. Incorporation of elements of sustainable design. Feedback from the judges: The simplicity and elegance of this project belies the fact that no one individual component is used in a non-conventional manner. Nonetheless, the beauty of the composition lies in the sensitive application of these components – the clear glazing, aluminum rod screen and structural steel frame – to create a harmonious, inviting and multi-layered play between interior and exterior. Feedback from the judges: The technical complexity of this design takes the often understated element of the curtain wall trim cap and makes it the major component of the visual identity of the building. Each vertical fin is a unique micro-design that, together with its neighbours, juxtaposes against the more conventional glazing of the composition to create a very dynamic and memorable façade. Feedback from the judges: The curvilinear form of the building’s plan coupled with the vertical cant in two axis of the curtainwall system requires significant design detailing and coordination, and generates construction challenges which are all successfully met. 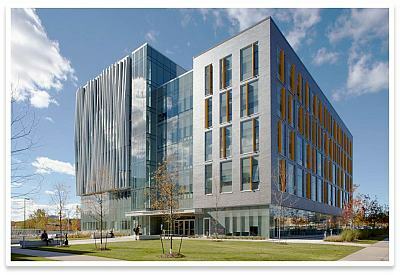 This building is a dynamic and excellent example of the application of standard curtainwall technology to create a very visually distinct façade. Feedback from the judges: Notwithstanding the impressive cantilevers, the elegant yet somewhat conservative exterior belies an impressive courtyard interior whose character is defined by an awe-inspiring curvilinear skylight. The transparency of the projecting glass-clad bays within the courtyard, juxtaposed against wood-slat clad walls, create visual nodes of activity and interest within the warm yet modern multi-storey space.